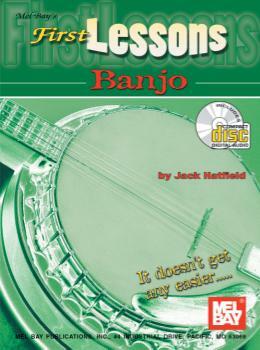 First Lessons on Banjo is an ultra-easy instruction manual for beginning five-string banjo played in the three finger style in G tuning. It can be used by those with no previous experience with the banjo or music of any sort. It is so basic it can be used even by small children. The book features very detailed descriptions of even the most basic aspects such as wearing the picks properly, the correct picking motion, and noting the strings properly. These are aspects that are so basic most manuals skip over them. There are many detailed photos, several from the player's point of view, not from in front of the banjo. First Lessons on Banjo covers the most basic rolls, the Alternating Thumb Roll and two Forward Rolls, plus the three basic chords plus the relative minor chord. All musical examples are presented in tablature, with the melody notes in boldface type so the student knows which notes to emphasize. All arrangements include lyrics, which is very important to the novice who is trying to train the ear to hear the melody among the fill notes. Several tips and suggestions about the proper mental approach are included that will lead to playing by ear and arranging at an earlier stage in the student's development. There are also suggestions about developing the proper mental approach and about speed reading of tablature. These suggestions are not found in any other banjo instruction book. The 'finale' arrangement is Cripple Creek, a popular banjo standard that when mastered, should give the novice a great sense of accomplishment. The accompanying recording includes all tabbed examples, with the rhythm instruments and lead banjo in separate channels. The songs are played at three tempos, the first tempo VERY slow, then a medium tempo version, and finally at performing speed with guitar, mandolin and bass accompaniment. The up- tempo accompanied versions are all together at the end of the recording so it the final tracks be used as a listening recording. This also allows the student to play along with all the more interesting arrangements in sequence without skipping around the recording.